If you’re looking for a medium-sized young lady with a friendly, playful and engaging personality, you’ll have to come check out Pfeifer! 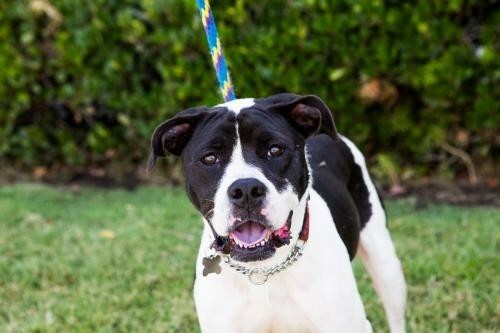 This sweet-faced Boxer mix was found as a stray. Upon her arrival at TBL, she made fast friends with Cowboy, another good-natured Staffy. The two enjoyed playing and exploring the yard together. Her boyfriend Cowboy was recently adopted at the end of July, and now it’s Pfeifer’s turn! Pfeifer is a smart cookie. She already has some basic commands under her belt, and even knows how to roll over on command! Pfeifer has proven herself to be a good hiking buddy on K9rs adventures all over the county. Her outgoing, goofy, and fun-loving disposition allows her to make new friends with ease. Pfeifer is a great medium size of 45 pounds, and we think she is just over a year old. Come give Pfeifer a spin and prepare to fall in love! If you'd like to meet Pfeifer, please visit www.thebarkinglot.net/adopt.